Learning sight words takes a ton of repetition and practice for some students. I try to incorporate sight words in a variety of ways in my classroom: as our word wall words each week, as a reading center option, as a daily guided reading practice, and fun, independent practice and games throughout the year. 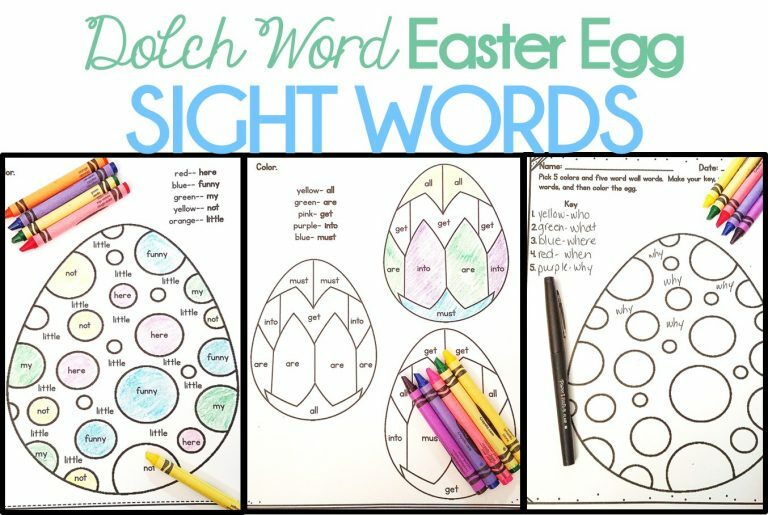 These Dolch Sight Words Easter Egg color by word sheets have been a favorite of many teachers! They are simple and straightforward, with students coloring the egg based on each Dolch sight word. I first made these Dolch Sight Word sEaster Eggs several years ago. I used the Dolch Primer list and added most of the words onto the list. There are two different styles included. This one with several small Easter eggs on it. And this one with one large Easter egg with students coloring in its background. This would also be a neat project with students cutting out the eggs and displaying them on the wall or a bulletin board. The last page included is a blank one that can be customized. Another idea for using these pages is to practice specific sight words based on your own class’s list. Here, I’m showing practice with the “wh” question words that my kids always struggle with. Each of my Dolch Easter Egg sight words sets includes 7 pages including all of those shown above. You can download the Primer set, the original, from my TpT store by clicking the image below. After so many people loved these, I created sets for the Dolch Pre-Primer words and the Dolch First Grade words. You can download those by accessing my freebie library that’s exclusive to my newsletter subscribers. Just enter your information, and then check your email for the login information and link to download! My not-very-regular newsletter is full of helpful tips and strategies, freebies, and resources to help you keep your classroom fun and functional. Tessa, I just found your blog from the K-2 Linky Party, and I am loving it! If you have time, it would be so nice if you could stop by mine and tell me what you think. I'm a blind pre-k teacher but I'm moving back to kindergarten next year. Talk to you soon. Thanks for stopping by! I went over to your blog really quick and liked some of the items you posted. I will have to take a closer look when I have some time! This looks super cute!! Thank you so much for linking up! Thanks for having a linky party! I always love to try to reach new people through them. Oh yes I love it! My kinder kids need more help with their sight words and these will be fabulous! If you do make more, that would be awesome! I'm glad you like it. I may make one more set. If I made another set, it would probably be the Dolch 1st grade set. Do you have a particular list you'd like me to use? Hi I found your blog from Clasroom Freebies Too – love it! THanks! I know exactly who I'm going to use this idea with – the kids are going to love it! Hi! This is awesome! I found your blog through the linky party! Stop by my blog for a giveaway I'm having! Thanks for providing a blank one as well. None of the lists quite matched our words but I can still use this to add to our centers. Thanks again! That's the problem with sight words, isn't it? Everyone seems to have their own list. I'm glad the blank one will be useful for you. Thanks for linking up with my "It's a Spring Thing" linky party! Thanks! I don't have anything that's specifically spring, so I'm glad the Easter stuff is okay. Could put the sight word eggs to use in my sped classroom!